…but If you love Bali as much as I do then there is no doubt you want to know what the best places are for that perfect romantic holiday. 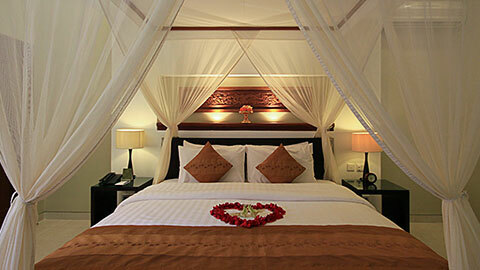 It’s always good to get first hand recommendations when it comes to Bali honeymoon hotels and villas. and that is exactly why we have created this list of the best honeymoon destinations so you can rest assured you know you are getting a holiday that looks just like the pictures. Without wasting anymore of your time let’s take a peek at the best places to book for your honeymoon! Only a short journey from the famous Pura Luhur Uluwatu temple, guests at The edge are more commonly embracing love than partying. 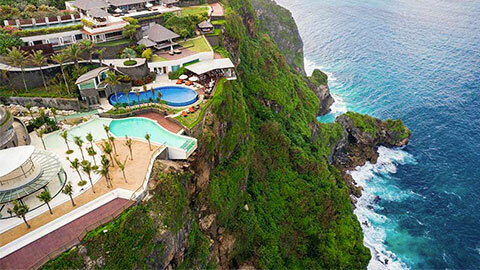 This game-changing cliff-top club oneeighty is built alongside a series of cascading ponds, spilling into a jaw-dropping glass-bottom sky pool which extends 6.5 metres over the edge of the Uluwatu cliff. With dedicated, yet discrete butler service, superlative food & beverage, a breathtaking spa and truly opulent villas set amongst lush tropical gardens, The edge provides the perfect setting to celebrate a honeymoon or romantic escape. 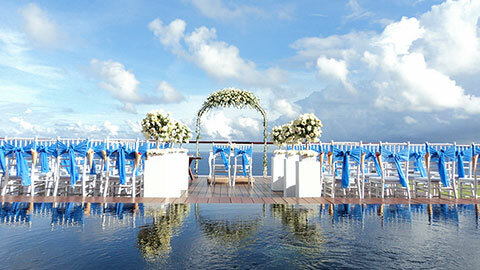 Romantic dining options or intimate proposal dinners can be custom made on request. 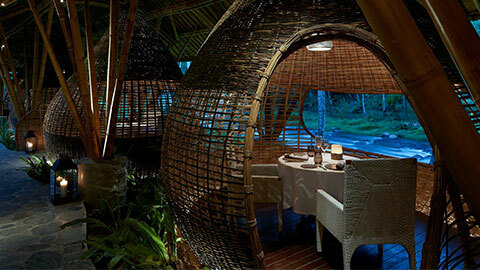 Mandapa is a place that is fully immersed into the surroundings. Providing renowned service at every touch point to awaken the spirit and provide rich, meaningful memories to last a lifetime. 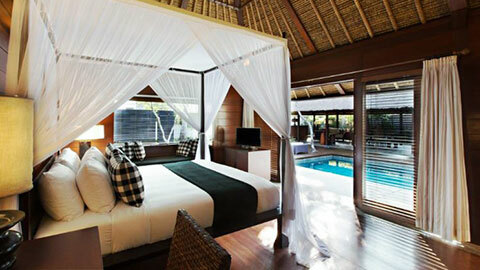 With a restaurant as gorgeous as this how could we not put it in our list of best Bali honeymoon hotels. 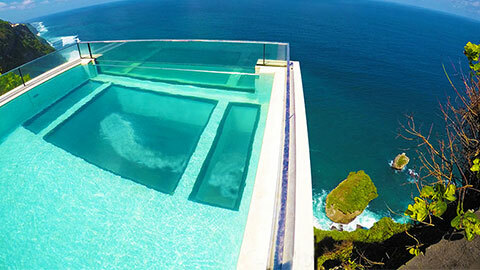 LUXE Villas offers an exclusive window to Bali’s enchanting culture in one of the most fascinating places on earth. Step into bliss among a beautiful terraced landscape. Enjoy exceptional cuisine from their master chef. Stunning sunrise breakfasts, exquisite mid day feasts or romantic evenings of candle light dining. Kayumanis Jimbaran Private Estate & Spa is an exotic retreat hidden amongst the coconut trees and the romance of Jimbaran bay. 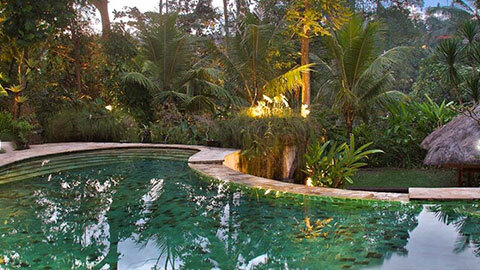 Each villa is extremely spacious and situated among the trees to ensure each guest feels private. 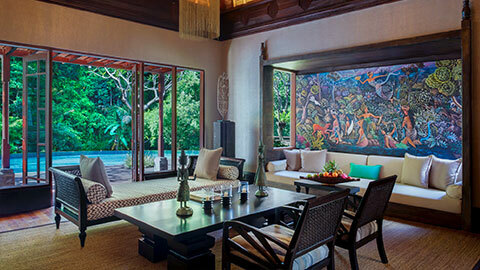 Kayumanis Jimbaran Private Estate & Spa is the perfect setting to chill with astounding privacy and unrivalled luxury. Located just meters from a traditional fisherman’s beach. 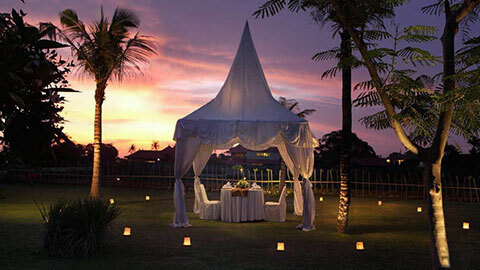 Kayumanis Jimbaran Private Estate ensures you are rejuvenated or romanced in every way possible. 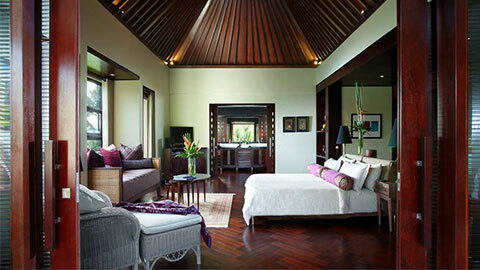 With 18 fully serviced private villas you can be sure your every need or want is met at The Kunja Villas and Spa. Located in Bali’s trendy Seminyak and just minutes away from the beautiful golden sandy beaches, shopping boutiques and delightful restaurants The Kunja offers everything for those looking to romance but still be nearby the hustle and bustle. P.S Without saying too much as I don’t want to ruin the surprise but their welcome package for the honeymoon villa left me speechless. Warwick Ibah Luxury Villas and Spa offers 17 unique rooms. 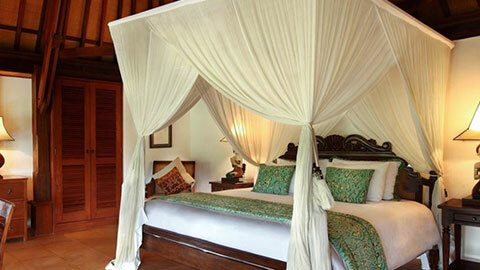 Each bed comes beautifully draped canopies on each large solid wooden base. 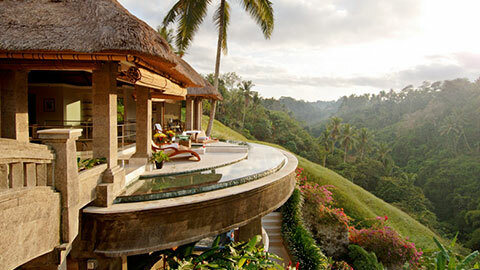 With arguably the best views of the Ubud hillside anyone has ever seen Warwick is a hotel to be reckoned with. Warwick offers some of the most refined dining in all of Bali, so good in fact you may never leave your suite (Unless of course you make your way to the beautiful Garden Restaurant which places you right in the heart of Bali’s flora and fauna). With high thatched roofs, draping canopies on the beds, each pool has stunning jungle views and marble and teak finishes the Viceroy has set itself as truly one of the greatest hotels in Bali. Each room contains it’s very own private heated pool, air conditioning marble bathrooms and modern technology allowing you to feel blissfully away from the world but close by just incase. Featuring it’s very own helicopter pad the Viceroy can literally be a fly-in, fly-out hotel if you wish. 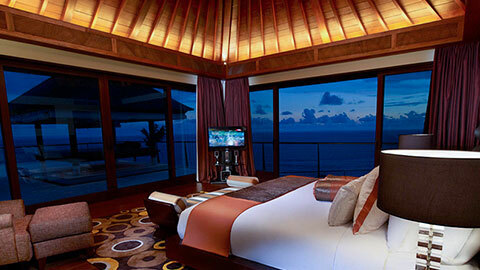 As one of the most exclusive Bali honeymoon hotels it is also undoubtedly one of the best by far. The Cascades Restaurants harbours on the edge of the valley giving you the ultimate view of the Ubud jungle whilst you dine on some of the most exquisite food you will ever eat. 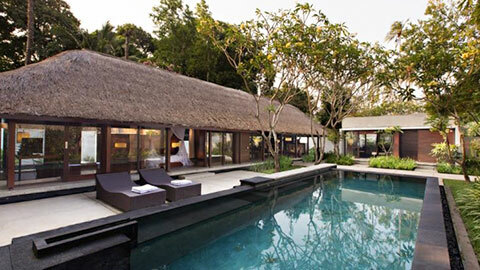 Recognized as one of Bali’s most intimate Luxury retreats. 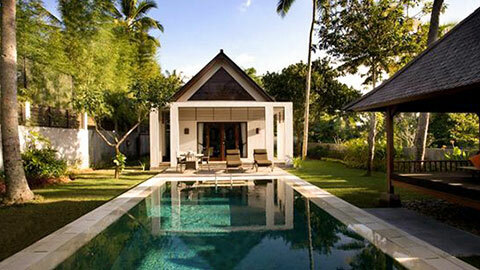 The Chedi Club boasts 20 individual villas situated on 5 hectares of in the highlands of Ubud. From the resorts very own amphitheater you can watch the Kecak Dance (one of Bali’s most dramatic performances). 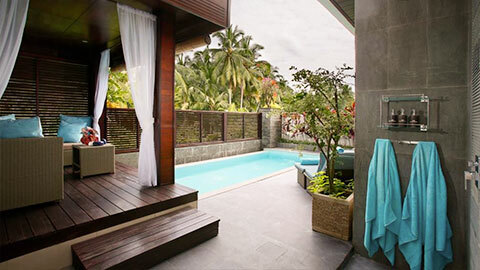 Lose yourself in the Spa, situated within the paddy fields, or simply relaxing by the pool for days on end. 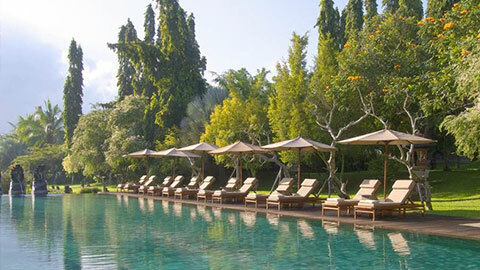 The Chedi Club is definitely one of the most relaxing and intimate hotels in all of Bali. 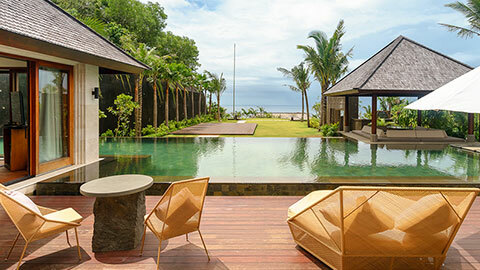 Not only one of the Bali Honeymoon hotels this year, The Chedi Club it is also one of the very best hotels in all of Bali. 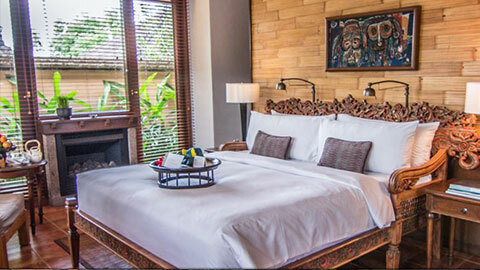 Right in the heart of Seminyak you will find one of Bali’s best Resorts, The One Boutique Villa. 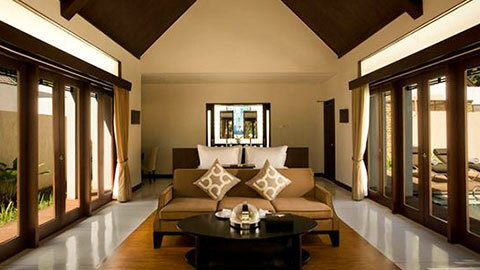 With only six villas in total they have made sure each is for use of a better word fantastic. They can help you with anything from dance lessons to servicing your own private romantic dinner. 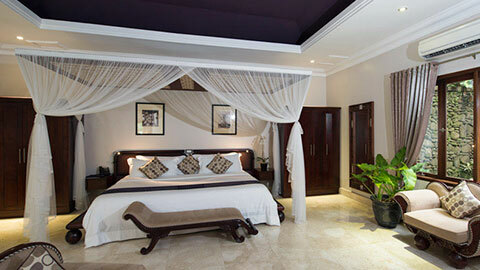 Boasting both one bedroom and two bedroom villas that will have anyone loving their stay. 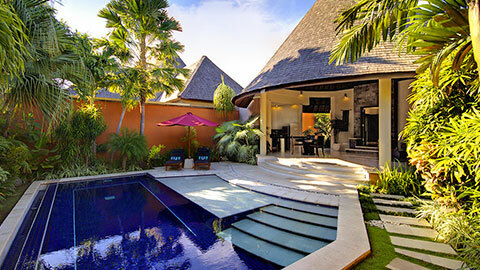 Each private villa comes with it’s very own pool, when it comes to affordability this is definitely one of the best Bali honeymoon hotels around. Set alongside the River Ayung, The Samaya Ubud has been designed to give you a unique experience of the Balinese hospitality. With spacious villas spectacularly located in the Ayung valley guest can walk the infamous Rice fields as often as they wish. The Swept Away Restaurant set upon the Ayung River, provides a soothing ambience whilst guests can enjoy a truly unique dining experience, with an array of modern and eclectic dishes, maintaining a strong focus on local produce and authentic flavours. With your choice of Villas nestled down by the river or up on the upper level closer to the reception, each of the spacious villas comes with a private lap pool with 1.8 meters deep. You can find all these Hotels and more HERE. With so many hotels and villas in Bali it is incredibly hard to find “just the right one” however the thousands of people that have rated these hotels the best romantic getaways can’t be wrong. 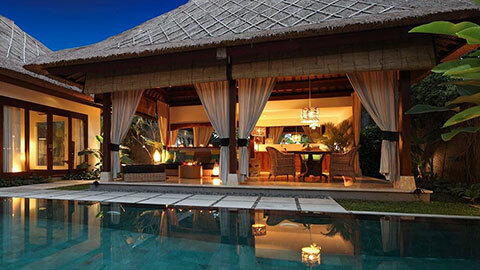 I have been to Bali many times throughout the years and been lucky enough to stay at each and every one of these on my travels, I can honestly say each one of these Bali honeymoon hotels not only lived up to my expectations but exceeded them.